While Big Data might be the talk of 2013, it would be nothing without a cloud infrastructure to back it. But how can you successfully use the cloud for your big data? 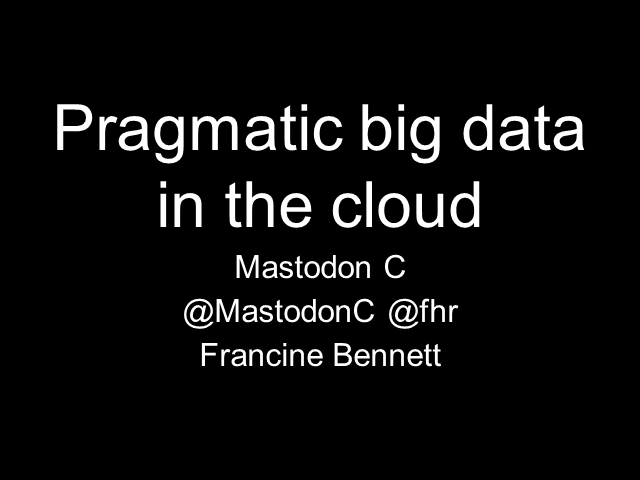 Join this webinar where Francine Bennett, CEO of Mastodon C, will talk you through the key steps in using a cloud infrastructure to set up and run big data systems and analytics. This will include your technology choices, managing costs, and ideas for what you can actually do with your big datasets once you've got them. Francine Bennett is a data scientist who previously worked on big data analysis for search engines. She is now CEO and cofounder of Mastodon C; an agile, big data specialist organisation who offer open source Hadoop-powered technology and analytical skills to help people, and organisations, realise the potential of their data. Francine Bennett, CEO and Cofounder, Mastodon C.
Presented by: Francine Bennett, CEO and Cofounder, Mastodon C.